is celebrating the opening of their newest 30,000 square foot fitness club in Fayetteville, NC at 210 Owen Dr with a ribbon-cutting ceremony on January 31, 2019. Dubbed the “All American” club, this state-of-the-art fitness club and gym facility truly sets a new standard for Fayetteville gyms and fitness clubs. A new Google StreetView virtual tour is available here. The All-American Grand Opening is another exciting step in the journey of Fit4Life in the greater Fayetteville area with its original Fayetteville gym location at 2803 Fort Bragg Rd, Fayetteville, NC 28303, and with this latest Fayetteville fitness club location, the health club continues to build on their reputation for fitness excellence. Their mission is to be a gym that helps people change their lives, empowering their clients to be fitter and healthier. To achieve this ambitious goal, they’re open 24 hours a day, 365 days a year and include state of the art fitness and strength equipment. Fit4Life Health Clubs is also proud to reveal the many upgrades and changes that have taken place over the last couple of months at their Garner/Clayton fitness club located at 9145 Cleveland Rd, Clayton, NC 27520. Garrett Marek, general manager for Fit4Life Health Clubs, had this to say about the opening, “We’ve worked hard to make our gym the best that it can be. We’ve listened to feedback from our current members and made changes based on their input.” The gym has added more floor space, upgraded equipment, added new classes, installed new showers and much more. Garrett was also quick to note that some important things have stayed the same – clients love our well-trained, friendly staff and they’re all still here, ready and excited to welcome back our happy clients. Current and new members are loving the new facilities, leaving rave reviews such as “Shaun and company have done an awesome job with this place! I have another gym much closer to me, but I drive the extra distance to work out here. Good variety of equipment, always clean and great staff!” Another happy client said, “I’ve been going there for several months now. I love the employees and the new facility. I also enjoy the senior fit classes. They are very attentive and caring and always willing to help.” Yet another client remarked on how they had managed to lose more than 50 pounds and had dropped three pant sizes and credited the healthy and positive environment plus facilities at Fit4Life Health Clubs. 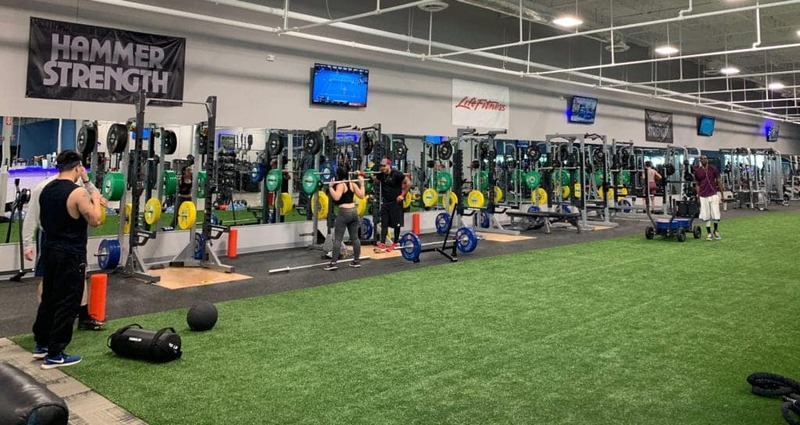 The management team at Fit4Life is proud to show off their new facilities, and they’re offering members of the public a free three-day pass to come in and test the facilities. Included in the free pass is access to group classes, different training areas, and the free childcare and changing room facilities. At Fit4Life Health Clubs we have a goal to provide a family friendly and motivating environment that encourages personal growth and development. We achieve this by providing every member with state of the art equipment, clean facilities and a professional & caring staff prepared to support you and help you reach your fitness goals! There are a number of services that are part of a gym membership at Fit4Life. Both the All American and Garner/Clayton gyms offer free child drop area that is available 24/7, 365 days a year. There is no charge for this service (it’s included in the membership), and has plenty of toys, a live camera feed displayed on 2 locations in the gym so parents can keep an eye on their children while they’re working out, as well as free WIFI. Also available with a gym membership are group classes. Among others, the Clayton/Garner Fit4Life offers yoga, Zumba, boot camp, spinning and sculpting classes. In addition, the beautifully revamped changing and shower facilities are available. Fit4Life Health Clubs has 12 locations serving North Carolina including Benson, Cameron, Clayton, Dunn, Fayetteville Fort Bragg Rd, Fayetteville Owen Dr, Goldsboro, Greensboro, Mt Olive, Raeford, Richlands, Spring Lake and Zebulon with a total of 12 locations across eastern NC. All the gyms are open 24/7/365, have top class equipment, friendly staff and a wide variety of group classes so that there’s something for everyone.